Lamine Chikhi, “Al Qaeda gets help from Mali officials: ex-rebel,” Reuters, April 12, 2010, http://www.reuters.com/article/2010/08/12/idUSCHI251113. In late November 2016, U.S. officials said that Belmokhtar had likely died earlier that month in a targeted French airstrike in Libya.Gordon Lubold and Matthew Dalton, “U.S.-French Operation Targeted Elusive North African Militant, U.S. Says,” Wall Street Journal, November 27, 2016, http://www.wsj.com/articles/u-s-french-operation-targeted-elusive-north-african-militant-u-s-says-1480276417. However, in June 2018 it was reported that Belmokhtar was still alive and living in North Africa.Malek Bachir, “Armed Islamist leaders in Libya claim al-Qaeda's Belmokhtar is still alive,” Middle East Eye, June 13, 2018, http://www.middleeasteye.net/news/algeria-libya-mokhtar-belmokhtar-alive-qaeda-aqim-islamic-state-1799384986. Drew Hinshaw and Zoumana Wonogo, “Al Qaeda Attacks in Burkina Faso Kill at Least 30,” Wall Street Journal, January 17, 2016, http://www.wsj.com/articles/operation-ends-at-burkina-faso-hotel-seized-by-al-qaeda-1452936866. Missy Ryan, “The U.S. still doesn’t know if it’s killed this legendary one-eyed militant,” Washington Post, February 17, 2016, https://www.washingtonpost.com/news/checkpoint/wp/2016/02/17/the-u-s-government-thought-it-had-killed-this-legendary-militant-now-its-not-so-sure/. “Profile: Mokhtar Belmokhtar,” BBC News, June 15, 2015, http://www.bbc.com/news/world-africa-21061480. “Belmokhtar, Mokhtar Wanted By The Judicial Authorities of Canada For Prosecution / To Serve A Sentence,” Interpol, accessed November 15, 2016, https://www.interpol.int/notice/search/wanted/2013-52008. In the Sahara, Belmokhtar integrated himself into local communities, earning loyalty by marrying into influential tribes and buying off local leaders. “PENPIX-The main players in al Qaeda's Saharan operations,” Reuters, April 12, 2010, http://www.reuters.com/article/2010/08/12/idUSCHI137569; “Factbox: ‘Uncatchable’ jihadist kingpin said behind Algeria raid,” Reuters, January 16, 2013, http://www.reuters.com/article/2013/01/16/us-algeria-kidnap-belmokhtar-idUSBRE90F16Y20130116. He also gained loyalty through his ability to procure food and jobs from his cigarette smuggling business. Fellow militants nicknamed Belmokhtar “the diplomat” as a result of his ability to build regional alliances, and he was even reported to have established ties with senior Malian officials.Lamine Chikhi, “Al Qaeda gets help from Mali officials: ex-rebel,” Reuters, April 12, 2010, http://www.reuters.com/article/2010/08/12/idUSCHI251113. According to one insurgent speaking in 2010, local tribes in Mali and Niger considered him “more popular than their presidents.”Lamine Chikhi, “Al Qaeda gets help from Mali officials: ex-rebel,” Reuters, April 12, 2010, http://www.reuters.com/article/2010/08/12/idUSCHI251113. Associated Press, “3 dead, 12 wounded in attack on UN base in Mali,” Fox News, March 8, 2015, http://www.foxnews.com/world/2015/03/08/mali-3-dead-12-wounded-in-attack-on-un-base-in-northeastern-city-kidal/. In May 2017, al-Mourabiton’s council of elders dismissed Belmokhtar as the group’s leader after an extended absence from leadership meetings dating back to the 2016 airstrike. His deputy, Abderrahmane al-Sanhaji, was chosen to replace him as the group’s new leader.Malek Bachir, “EXCLUSIVE: Notorious leader of Saharan al-Qaeda group loses power,” Middle East Eye, May 9, 2017, http://www.middleeasteye.net/news/exclusive-belmokhtar-dismissed-leadership-al-mourabitoun-274790462. That year on November 15, the Algerian government sentenced Belmokhtar to death in absentia after finding him guilty of forming and leading a terrorist organization as well as dealing weapons.“Algeria: Death sentence for Mokhtar Belmokhtar,” Middle East Monitor, October 16, 2017, https://www.middleeastmonitor.com/20171016-algeria-death-sentence-for-mokhtar-belmokhtar/. In June 2018, reports surfaced that Belmokhtar was still alive and currently living somewhere between the borders of Chad, Niger, and Mali.Malek Bachir, “Armed Islamist leaders in Libya claim al-Qaeda's Belmokhtar is still alive,” Middle East Eye, June 13, 2018, http://www.middleeasteye.net/news/algeria-libya-mokhtar-belmokhtar-alive-qaeda-aqim-islamic-state-1799384986. Mister Marlboro“Factbox: ‘Uncatchable’ jihadist kingpin said behind Algeria raid,” Reuters, January 16, 2013, http://www.reuters.com/article/2013/01/16/us-algeria-kidnap-belmokhtar-idUSBRE90F16Y20130116. The One-Eyed Sheikh “Libya arrests wife of wanted one-eyed militant leader Mokhtar Belmokhtar,” National (Abu Dhabi), November 22, 2016, http://www.thenational.ae/world/middle-east/libya-arrests-wife-of-wanted-one-eyed-militant-leader-mokhtar-belmokhtar. The Uncatchable“Rewards For Justice - Mokhtar Belmokhtar - Reward For Information (English),” U.S. Department of State, June 4, 2013, http://www.state.gov/documents/organization/210649.pdf; Casey Britton, “AQIM : Answers to Open Meeting with Sheikh Abu Abdul Ilah Ahmad,” WorldAnalysis.net, April 19, 2013, http://worldanalysis.net/modules/news/article.php?storyid=2197; “PENPIX-The main players in al Qaeda's Saharan operations,” Reuters, April 12, 2010, http://www.reuters.com/article/2010/08/12/idUSCHI137569; “Factbox: ‘Uncatchable’ jihadist kingpin said behind Algeria raid,” Reuters, January 16, 2013, http://www.reuters.com/article/2013/01/16/us-algeria-kidnap-belmokhtar-idUSBRE90F16Y20130116; Bernard Vaughan, “U.S. prosecutors charge al Qaeda commander over Algeria attack,” Reuters, July 19, 2013, http://www.reuters.com/article/2013/07/19/us-algeria-alqaeda-idUSBRE96I14120130719. Le BorgneMalek Bachir, “Armed Islamist leaders in Libya claim al-Qaeda's Belmokhtar is still alive,” Middle East Eye, June 13, 2018, http://www.middleeasteye.net/news/algeria-libya-mokhtar-belmokhtar-alive-qaeda-aqim-islamic-state-1799384986. Belaawer“Algeria: Death sentence for Mokhtar Belmokhtar,” Middle East Monitor, October 16, 2017, https://www.middleeastmonitor.com/20171016-algeria-death-sentence-for-mokhtar-belmokhtar/. The U.S. Department of the Treasury listed Mokhtar Belmokhtar as a Specially Designated Global Terrorist on October 24, 2003.“U.S. Designates Three Individuals And One Organization Involved In Terrorism In Algeria,” U.S. Department of the Treasury, October 24, 2003, http://www.treasury.gov/press-center/press-releases/Pages/js944.aspx. 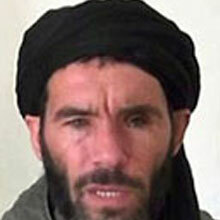 The United Nations designated Mokhtar Belmokhtar, pursuant to paragraphs 1 and 2 of resolution 1390 (2002), as an associate of Al-Qaida, Usama bin Laden or the Taliban for “participating in the financing, planning, facilitating, preparing or perpetrating of acts or activities by, in conjunction with, under the name of, on behalf, or in support of” and “recruiting for” the Organization of Al-Qaida in the Islamic Maghreb (QE.T.14.01).“NARRATIVE SUMMARIES OF REASONS FOR LISTING: QI.B.136.03. Mokhtar Belmokhtar,” U.N. Security Council, July 8, 2009, last updated September 9, 2014, https://www.un.org/sc/suborg/en/sanctions/1267/aq_sanctions_list/summaries/individual/mokhtar-belmokhtar. Mokhtar Belmokhtar (a.k.a. Mr. Marlboro) is a co-founder of al-Qaeda Islamic Maghreb (AQIM) and the leader of AQIM’s Malian-based Mourabitoun branch. “It is the birth of a group that includes Mujahideen and even Muslims in North Africa from the country of the Nile and the Atlantic.”Kissima Diagana and John Irish, “Sahara jihadist groups merge, threaten French interests – report,” Reuters, August 22, 2013, http://www.reuters.com/article/2013/08/22/northafrica-islamists-idUSL6N0GN2OQ20130822. “[Claiming responsibility for lethal hostage crisis at a gas plant in Algeria:] We in al Qaeda announce this blessed operation.”Lamine Chikhi, “WRAPUP 6-Algeria hostage crisis death toll hits 80, could rise further,” Reuters, January 20, 2013, http://www.reuters.com/article/2013/01/20/sahara-crisis-idUSL6N0AO37H20130120. Stresses the need to “attack Western and Jewish economic and military interests.”Myra MacDonald, “Belmokhtar burnishes jihadi credentials with Algeria attack,” Reuters, January 17, 2013, http://www.reuters.com/article/2013/01/17/sahara-crisis-belmokhtar-idUSL6N0AMCX620130117.